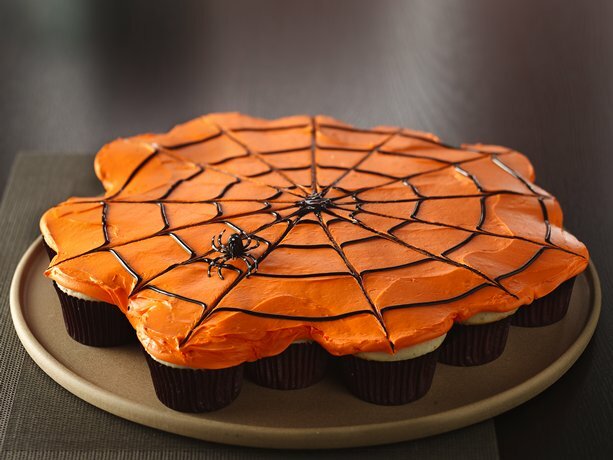 Today's Halloween Themed recipe is how to make "Pull-Apart Spiderweb Cupcakes". They look so pretty for your halloween parties. Treat your family with a perfect Halloween dessert! Enjoy these wonderful spiderweb cupcakes made with Betty Crocker® SuperMoist® white cake mix and Betty Crocker® Whipped fluffy white frosting. Mix and bake cake mix as directed on box for 24 cupcakes. Cool 10 minutes; remove from pans to cooling rack. Cool completely, about 30 minutes. On large round platter or pizza pan, arrange cupcakes, placing them close together. In medium bowl, mix food color and frosting. Spread frosting over cupcakes and spaces in between to create 1 large circle of frosting. Squeeze 1 large dot of black gel in center of frosting. With gel, draw concentric circles around the dot, spacing them about 2 inches apart. To create the web design, drag a toothpick from the center dot to the outer edge of the circle, about 12 times. Place plastic spiders on web. Store loosely covered. Use gummy spider candies for more color and to make this dessert completely edible. Look for black cupcake liners with a spiderweb motif to complete the theme. To easily transport the spiderweb, build it on a portable deli tray that comes with a cover.